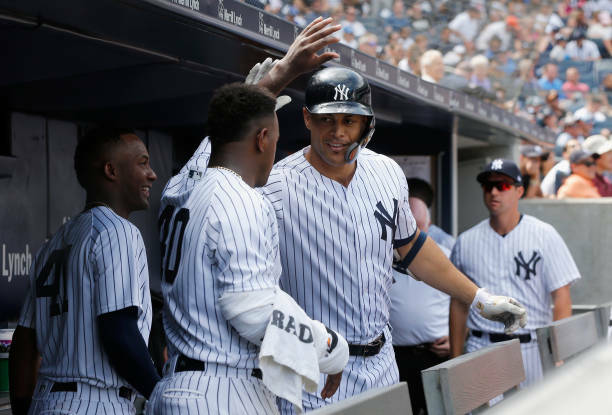 On Tuesday afternoon at Yankee Stadium, Luis Severino and Giancarlo Stanton spoke to reporters about the Yankees’ upcoming American League Wild Card matchup against the Oakland Athletics. Q1: Luis, what does this mean to you given how your second half went and how last year’s Wild Card game went for you, that Aaron has the confidence in giving you the ball tomorrow night? A1: It means a lot. It means that they trust me. They know that I can be good, that I can be better. I mean, you guys know me; I can have trouble, and the next start I can be good. If something bad happens, it happens at that time, I just get over it and keep working and get better. Q2: How important is it tomorrow night, and how important has it been lately to have your fastball command? A2: I think every day is important, but a game like that one, you know, will be the best game that I can have that day. From the bullpen, I had to go with that command. That’s my pitch. If my fastball is working, my command is good, I think I can do a very good job. Q3: Luis, obviously everybody knows last year that you had a rough start in the Wild Card game but pitched very well after that. Do you think it was just kind of being too excited last year, or looking back, why do you think you had trouble in that Wild Card game? A3: Maybe it was that. Maybe too excited, trying to do too much. But the good thing was that we won, won that game, and we’ll move on and do a better job. But yes, I think that was the main thing. I was too excited. It was a good experience. Now I’ll take that tomorrow and try to treat that game like a regular game. Q4: How much of your struggles in the second half do you attribute to the fatigue, and how much do you think the extra rest you’ve gotten lately and coming into this start helps you? A4: I would say I don’t feel tired. I’ve been missing my spots lately, a couple fastballs and sliders, but the last three or four outings, I’ve been feeling better, the command, changeup and the slider have been good. Like I say, I don’t feel tired. If I struggled in the past, it was because I was losing my command. Q5: How different is it to have prepared for a start that you might not have known was coming until a couple of days ago? What has that been like for you? A5: It’s tough. You know, I’m excited we got to know at least four or five days before. But I thought it was going to be Happ, Tanaka or me, so I was thinking, if they ask me, I’ll be ready. I’ll be doing my bullpens, all my stuff. Even if I don’t start, I’m going to be in the bullpen to help my team. Q6: Aaron has said that before they even selected a starter, whoever it might be, they could go to the bullpen early in this game. Does that affect your mindset? Are you in a “go as hard as you can for as long as you can” mindset, not knowing if that might mean third, fifth, seventh inning? A6: I just want to win. Whatever happens, if I can go four good innings and then the bullpen comes, that would be great. I just want to win and move up and go to Boston and try to win there. Q7: What went wrong in your start against the A’s early last month? And your relationship with Sanchez, there were quite a few wild pitches, passed balls that game? A7: I think it was a miscommunication between us. I think we didn’t set the right signs and stuff like that. But we talked about it. We figured it out, and after that, I think everything was great. Q8: Looking at that A’s lineup, what do you think is most challenging facing them? A8: I think they have a good lineup. They have a lineup that can hit everywhere. They can go to the right field, go to left field. But I’m looking forward, like I said earlier, command my fastball. If I can get that fastball inside, and if that slider is sharp, I think I can get through that lineup. Q9: You had a couple starts this year in the second half that were backed up, a couple extra days’ rest. How do you think that prepares you for this when you’re going to have eight days’ rest? A9: I think it’s going to be good. It’s a good rest. I threw two bullpens in between, and I feel good. I feel like I always feel; I feel ready. I feel that I can do a good job. Q1: Giancarlo, how much have you been looking forward to this opportunity to represent the Yankees in the postseason? A1: All year. You know, it’s been a long road so far, and we’ve got work to do. But it’s going to be fun. It’s going to be an exciting day tomorrow, and we’ve got to show out. Q2: Is this why you came to New York? And also, what do you anticipate in terms of the atmosphere tomorrow? A2: Yeah, for sure. And I anticipate it as crazy as ever tomorrow. I’ve heard stories about last year, so I expect it up a notch from last year. Q3: You’ve had a chance to play with Aaron Judge now the whole year. What’s the impression that he’s left with you as far as how he’s handled the expectations, which I know you’re familiar with, as well, and anything you picked up that maybe you couldn’t have from afar? A3: He knows what’s at stake here, he knows how you need to step up and be kind of the light that people look towards. That’s with work ethic, that’s how you approach on and off the field, and he’s done a great job at it. Q4: Now that you’re at this point, how did you find the whole adjustment, transition period to being a Yankee and everything surrounding it? A4: I mean, all in all, a lot of things were different for me, and that’s life. That’s coming to a new team. The Yankees are more magnified than most, but you know, you’re aware of that going in, and you adjust for things you maybe didn’t think about or process before. Q5: Was it harder or easier than you expected? A5: Honestly, I left it open. It’s different things expected, be there and adjust along the way. Q6: How would you sum up your first year here? A6: A solid year. Not the way I would have liked in terms of full consistency, but solid overall. Q7: As you guys all got healthy again the last couple of weeks of the season, what did you learn about your lineup? You guys all didn’t get to play together for a very long time, especially in the second half of the season. A7: Part of it I think was good for us. We benefited from it, from having to survive without being full strength, and maybe when the guys got back, we dropped another guy, and just all the things going against us there, and we were still able to put up a 100-win season and still find a way to scrape by when we weren’t full strength. I think full strength is coming at the perfect time, and yeah, nothing more you could ask. Q8: Severino is starting the game tomorrow; what have been your impressions of him this year, your first year playing with him? A8: He’s not an easy at-bat, I’ll tell you. You guys can say what you want about the beginning of the second half or how he’s been, but I wouldn’t want to be in there against him. We’re going to go into tomorrow ready and knowing he’s going to show up. Q9: Right before an elimination game when they might be throwing eight, nine pitchers at you guys, does that change your preparation at all? A9: Yeah, you’ve got to be aware of that, but then again, even if they bring a starter in and you beat him up a little bit, you’ve got to expect a bunch of different pitchers each inning. You’ve got to be ready on all cylinders. Q10: You talked about all you went through this season and you were able to achieve the 100-win season and all the home runs. Can you put into perspective what’s your approach where it’s all or nothing or you guys go home? A10: Yeah, it’s a quick turnaround from “how did your season” go to now. That season is over. That’s already in the past, even though it’s a couple days ago, but now it’s postseason. Now it’s a brand new start, and we’ve just got to show up. We’ve got to be there and not try to do too much, not try to come out of what we’ve done all year, and just stay in line. Q11: The A’s went from last place last season to the playoffs this season. From afar, what stands out about Oakland? A11: They’re hungry. I mean, I think they’re tired of getting beat up by the Astros for a couple years and maybe some other guys in their league. But they’re hungry. They’ve got the fight in the guys they’ve built, and yeah, they’re coming in hot. Q12: Back to the question of the bullpen, Oakland is using a bullpen game. What’s your impressions of that, and where are we in today’s game that a team would do that in the biggest game of the year? A12: It’s a game of adjustments, and that’s how it seems, whether it’s adjusting to team lineups or just how their starters and relievers match up with teams. In a case like Tampa, they didn’t have enough starters, so that’s kind of what started them to do that with the relievers, and then it was successful, so a couple other teams started picking it up. You don’t know where it’s going to go from here, but that’s kind of the new age we’re in right now.